Stem Cells: cells that upon division replace their own numbers and also give rise to cells that differentiate further into one or more specialized types. Posts in this category pertain to the moral, ethical, legal, scientific, and philosophical matters regarding the use of adult and embryonic stem cells in research and treatement. Quietly, Adult Stem Cells (ASCs) continue to make more advances in therapeutic treatments, thanks to the recent breakthrough with induced pluripotent stem cells (iPSCs), in which differentiated human skin, adipose (fat), or other cells are induced into reverting into a pluripotent state that essentially mimics embryonic pluripotent stem cells. These iPSCs have recently been induced into differentiating into heart cells, repairing damaged, premature lung cells, and treating cancer and a host of other disorders. Gepstein and his team from Technion's Rappaport Faculty of Medicine and Rambam Medical Center used reprogrammed iPSCs derived from healthy human subjects' skin cells with the characteristics of pluripotent embryonic stem cells. They were then able to convert them into heart cells with all the necessary properties such as expression of heart-related genes, spontaneous electrical activity, mechanical contraction, and response to various hormones such as adrenaline. Published in the latest issue of Circulation, the findings by Professor Lior Gepstein of the Technion-Israel Institute of Technology could make it possible to clinically repair damaged human hearts. Such an application is at least 10 to 20 years away, says Gepstein, but the process can already be utilized for in-depth study of genetic diseases and the development of personalized drugs for irregular heartbeats and other inherited disorders. Taking a patient's own cells and turning them into iPSCs for use in tissue repair and regeneration would also eliminate the risk of rejection by the body. A study now published in the American Journal of Respiratory and Critical Care Medicine demonstrates that bone marrow–derived, multipotent mesenchymal stem cells (MSC) may have therapeutic benefits in treating lung diseases such as BPD and pulmonary hypertension. The study was conducted at the University of Alberta, with collaborators from McGill University as well as labs in France and the US. Led by Dr. Bernard Thébaud, the study used both in vitro and in vivo experimental models to test the potential benefits of delivering stem cells to the damaged lungs. Babies who are born extremely premature – before 28 weeks – cannot breathe on their own. In order to help the babies' lungs to develop, neonatal doctors give them oxygen and drugs to help them breathe. These treatments contribute to a chronic lung disease known as Bronchopulmonary dysplasia (BPD). At present there is no treatment to heal the lungs of these premature babies. 50% of babies born before 28 weeks will get chronic lung disease. Case studies have shown that as these babies grow up, they continue to struggle with lung disease, coping with reduced lung function and early aging of their lungs. "The dilemma we face with these tiny babies is a serious one. When they are born too early, they simply cannot breathe on their own. To save the babies' lives, we put them on a ventilator and give them oxygen, leaving many of them with chronic lung disease," says Dr. Thébaud. "Before the next decade is out I want to put a stop to this devastating disease." Now, such incurable diseases can be treated by Stem Cell Therapy. Where Stem cells are being taken from patient’s own bone marrow, Adipose derived fat stem cells, peripheral blood derived stem cells or Umbilical cord blood-derived & placenta-derived immune rejection free stem cells. No. of experts in different parts of the world say Germany, Mexico, Ukraine, India, China and many more have treated thousands of patients suffering from incurable disease improving their Life quality. Latest research has shown that stem cell therapy has the potency to treat more than 75 life threatening diseases including cancers, Thalasemia, Blood disorders, Immune deficiencies, connective tissue disorders and metabolic/storage disorders. More than the existing uses of cord blood stem cells, research indicates that these stem cells someday may be used to treat numerous other diseases including Alzheimer’s disease, diabetes, diseases of heart and liver, multiple sclerosis, muscular dystrophy, spinal cord injury and stroke. Another research has suggested that skin tissue derived from stem cells can be effectively used for the treatment of burn victims. The future is indeed bright, as ASC and iPSC research continues to produce valuable results and potential treatments and therapies, without any of the ethical concerns of embryo-destructive stem cell research. The Vatican recently issued a statement on bioethical issues, entitled Dignitas Personae (The Dignity of the Person), which serves as the authoritative ruling for the Catholic Church in condemning, among other things, embryo-destructive stem-cell research and human cloning. The dignity of a person must be recognized in every human being from conception to natural death. The church therefore views scientific research with hope and desires that many Christians will dedicate themselves to the progress of biomedicine and will bear witness to their faith in this field. The body of a human being, from its very first stages of development, can never be reduced merely to a group of cells. The embryonic human body develops progressively according to a well-defined program with its proper finality, as is apparent in the birth of every baby. From this foundational position, the statement makes the logical conclusion that embryo-destructive pursuits (including embryonic stem cell research) are immoral. So, given this position, I would expect a headline such as "Vatican document condemns cloning, stem cell research", just as a matter of course. But how do the ostensibly upstanding journalists at the Honolulu Advertiser portray the ruling? Why, "Vatican condemns modern science research", of course. Contrast that gem of journalistic integrity with the (Minneapolis/St. Paul) Star-Tribune's take: "'Dignity of a person' reinforced in Vatican bioethics document." Well now, that sounds just a little bit more accurate. There are lies, damn lies and anything uttered by Donn Rubin. Missouri Coalition for Lifesaving Cures (sic) chairman Donn Rubin has already proven himself to be a spin master, but his latest screed is downright slanderous. In this op/ed piece (h/t Secondhand Smoke), Rubin lauds recent advancements in stem cell research, in which differentiated (adult) stem cells have been induced to revert to a pluripotent (i.e. "embryonic") state. He then goes on to claim that Missourians who oppose embryonic stem cell and cloning research (actually, he refers to such opponents as "stem cell research opponents" - as usual, intentionally obfuscating the difference between research with adult and embryonic stem cells) would have stood in the way of the research that led to these advances. I think now is as good of a time as any for a good, old-fashioned, paragraph-by-paragraph fisking of Dehr Spinmeister. Anti-stem cell groups would deter successes. I defy Rubin to identify even one "anti-stem cell group." To my knowledge, no such group exists. If it does, it is by no means mainstream, and is certainly no credible threat to ESC proponents in Missouri. Missouri Coalition for Lifesaving Cures lauds the stem cell advances occurring around the world as tremendous steps in medical science's ongoing battle to cure disease, and we eagerly await further discoveries as scientists continue the ethical exploration of this new medical frontier. An excellent example is last month's widely covered advances in Wisconsin and Japan where scientists were able to reprogram an ordinary skin cell to assume much of the versatility of embryonic stem cells. And, even more recently, this month scientists in London used embryonic stem cells to develop a stem cell "patch" to repair scar tissue from heart attacks and American scientists used embryonic stem cells as a novel way to test the safety of drugs. As the Secondhand Smoke post points out, the development of the "stem cell 'patch' to repair scar tissue from heart attacks" was in a Petri dish only. All of these advances demonstrate how important Missouri's constitutional protections are, ensuring that our patients and families have the same access as other Americans to whichever approaches prove most successful and lead to the best medical treatments and cures. Amendment 2 provided no meaningful protection for either the research that led to these advances nor for any potential treatment derived from them. Neither the research nor derived treatments were or have been threatened. The debated has always concerned Somatic Cell Nuclear Transfer (SCNT, a.k.a. cloning) in order to create viable human embryos for the express purpose of being destroyed in order to harvest pluripotent, embryonic stem cells. The research Rubin cited did not involve anything in that debate. If stem cell research opponents had their way, none of this outstanding science would have been possible. Ironically, they would have blocked the very groundwork that led to the technique they now seem to embrace — the reprogramming of ordinary skin cells into embryonic-like stem cells. Again, there are no such "stem cell research opponents" but rather opponents of human cloning and embryo-destructive research. In fact, many of us in that camp have very adamantly expressed that we must center our debate not on the ethical nature or efficacy of research involving embryonic stem cells themselves, but rather on the ethical nature and necessity of human cloning and the destruction of viable human embryos for the purpose of that research. Further, "reprogramming of ordinary skin cells into embryonic-like stem cells" in no way involves either human cloning or the destruction of viable human embryos; rather, it involves induction of a normal, differentiated skin cell into a pluripotent state. For years, anti-stem cell groups in Missouri have discounted the unique lifesaving potential of embryonic stem cells, dismissing evidence presented by the vast majority of leading medical and patient organizations. We're glad to see that they are beginning to accept this lifesaving potential. (Still waiting for Rubin to identify one of these "anti-stem cell groups in Missouri"...) To the contrary, we have not "discounted the unique lifesaving potential of embryonic stem cells" - with the exception of the uniqueness of that potential. Again, we do not oppose research involving pluripotent (even embryonic) stem cells; rather, we oppose the cloning and/or destruction of human life in order to obtain those stem cells. As for the "unique lifesaving potential" of ESCs, if that potential had been demonstrated sufficiently, the research would have support from the normal means of funding: the private sector; however, the private sector has indicated - by virtue of the direction of its funding - that it believes in the potential of adult stem cell research. Ironically, it is Rubin and his ilk that continue to ignore and discount the future potential and already proven efficacy of adult stem cells. They may have joined the bandwagon in celebrating a single technique, but they fail to acknowledge that the advance with reprogrammed cells was merely an initial step that can only achieve its medical potential through additional embryonic stem cell research. The scientists who led these advances, James Thomson of Wisconsin and Shinya Yamanaka of Japan, have stated clearly and unequivocally that all stem cell research must continue. It would be a tragedy if their successes were misused to cut off other important avenues of medical research. Yamanaka was an assistant professor of pharmacology doing research involving embryonic stem cells when he made the social call to the clinic about eight years ago. At the friend's invitation, he looked down the microscope at one of the human embryos stored at the clinic. The glimpse changed his scientific career. "When I saw the embryo, I suddenly realized there was such a small difference between it and my daughters," said Yamanaka, 45, a father of two and now a professor at the Institute for Integrated Cell-Material Sciences at Kyoto University. "I thought, we can't keep destroying embryos for our research. There must be another way." He said he had never handled actual embryonic cells himself, and the American lab uses them only to verify that the reprogrammed adult cells are behaving as true stem cells. "There is no way now to get around some use of embryos," he said. "But my goal is to avoid using them." Far from having stated "stated clearly and unequivocally that all stem cell research must continue," Yamanaka clearly and unequivocally wants to eliminate the need for the use of embryos for stem cell research - in fact, by his very words, it is his goal. Rubin's misuse of Yamanaka's research advances and intent in order to bemoan the alleged misuse of those advances moves beyond irony into audacity. It is simply beyond the pale for Rubin - who repeatedly dismisses embryos as "cells in a Petri dish" - to mis-characterize the intent of Yamanaka - who has stated that he sees little difference between a research embryo and his own daughters. Not only has Rubin no respect for the sanctity of all human life, but he also has no shame. If those seeking to repeal Missouri's constitutional stem cell protections get their way now, they would block the important research required to bring the new technique to its full lifesaving potential. Those whose aim it is to ban all embryonic stem cell research in Missouri cannot have it both ways. They cannot continue to oppose the very research that is required to achieve the lifesaving goals that they now claim to embrace. Those who threaten to repeal Missourians' access to stem cell research should step back and allow scientists to conduct the work necessary to achieve the goals that I hope we all share — to cure disease and improve the lives of patients and families. There you have it: Rubin's imagined opponents desire to "repeal Missouri's constitutional stem cell protections," to "ban all embryonic stem cell research in Missouri," and to "repeal Missourians' access to stem cell research." We've covered this one, but one more time, for the sake of thoroughness: we do not wish to repeal Missouri's constitutional stem cell protections (per se - I have no problems with protecting stem cell research, though I don't believe such an issue has any place in a state constitution; it is a constructionist matter, not a moral one). We do, however, wish to repeal Missouri's constitutional protection of human cloning. Further, the repeal of that protection would in no way whatsoever impact research such as Dr. Yamanaka's, since his research neither began with nor resulted in an embryonic cell of any kind - much less, one procured through the destruction of a cloned human embryo. Neither do we wish to ban all embryonic stem cell research in Missouri. We do wish to ban all human cloning, and oppose the destruction of human embryos for such research. Further, we oppose public funding of such research - and therein lies the key issue, and the Stowers (and other ESC researchers) cannot get sufficient private-sector funding, and want the government to foot the bill. Likewise, we in no way wish to repeal Missourians' access to stem cell research. We fully support research involving adult stem cells, and any other research not involving the destruction of human embryos. We also support their right to seek private funding for whatever legal research they wish to pursue. Rubin shows his usual lack of honesty and forthrightness; however, in this piece Rubin displays outright slander of his "opponents" and an intentional misrepresentation of Dr. Yamanaka's intentions. Donn Rubin is a liar. I only wish I could see what Mark Twain would actually have said about him. U.S. researchers say they've successfully reprogrammed adult stem cells from the testes of male mice into a wide variety of cell types, including functional blood vessels, contractile cardiac tissue, and brain cells. If the same can be done with adult testes stem cells from humans, they may offer a source of new therapies to treat men with health problems such as heart disease, vascular diseases, diabetes, stroke, Parkinson's, Alzheimer's, and even cancer, the researchers said. The study, by Howard Hughes Medical Institute scientists, is published in the Sept. 20 issue of the journal Nature. Adult stem cells are an attractive alternative to embryonic stem cells for therapeutic use. As yet there is no standard method for obtaining such cells from adults and priming them to form different tissues, but a new system that generates large numbers of stem cells from the adult testicle shows promise. It makes use of a novel marker, an orphan receptor known as GPR125, found on the surface of spermatogonial stem cells. The use of specialized feeder cells to support stem cell growth allows stem cells once destined for spermatogenesis to become multipotent. This work also provides clues as to the minimal requirements for multipotency in adult cells. Primary GPR125–LacZ SPC lines retained GPR125 expression, underwent clonal expansion, maintained the phenotype of germline stem cells, and reconstituted spermatogenesis in busulphan-treated mice. Long-term cultures of GPR125+ SPCs (GSPCs) also converted into GPR125+ MASC colonies. GPR125+ MASCs generated derivatives of the three germ layers and contributed to chimaeric embryos, with concomitant downregulation of GPR125 during differentiation into GPR125- cells. MASCs also differentiated into contractile cardiac tissue in vitro and formed functional blood vessels in vivo. Spermatogonial means "any of the cells of the gonads in male organisms that are the progenitors of spermatocytes." Progenitor cells are immature or undifferentiated cells, that may have stem-cell-like properties of self-renewal and differentiation. Thus SPCs are the undifferentiated cells that eventually produce sperm. Multipotent refers to the ability to differentiate into at least several cell types. Thus, MASCs are stem cells derived from SPCs. UPDATE: Mary Meets Dolly has also picked up the story. About a week ago, I wrote about this Post-Dispatch article, written by Matt Franck. I discussed the perceived bias in the article with respect to Amendment 2 and the efforts of supporters of the HJR11 anti-cloning measure the article discussed. As I try to do whenever I discuss someone's writing, I emailed the author to let him know of my blog post, and to allow (and to solicit) a response. To my pleasant surprise, Mr. Franck responded to my email. In the interest of fairness, based upon his response, I would like to re-visit the question of bias in his reporting of the Amendment 2 issue. My ability to respond to your email in detail is limited by time. But let me reply in brief. The stated aim of lawmakers who support HJR11 and its Senate counterparts is to essentially negate Amendment 2. Yes, I understand that the proposal doesn't mention the amendment. But the fact remains, it would make SCNT illegal -- something specifically protected under Amendment 2, and a procedure at the heart of the push to pass the ballot measure. Here, I agree with Mr. Franck that part of the underlying intent of HJR11 was to overturn parts of Amendment 2; however, the further intent of HJR11 was to expose the intentional deception and hypocrisy of Amendment 2 and that of its supporters and their $30 million propaganda campaign. Amendment 2 bans human cloning and makes any attempt to clone a human being a felony crime. Opponents of stem cell research claim that making stem cells in a lab dish is the same thing as "human cloning." Medical experts and most other people disagree with that view and understand that "human cloning" means creating a duplicate human being – not making stem cells in a lab dish. The truth of the matter - as exposed by Amendment 2 supporters' objections to HJR11 - is that, currently, (embryonic) stem cells cannot be made "in a lab dish"; they must be harvested from an embryo. To date, stem cells must be harvested from embryos resulting from natural or in vitro conception. The comment about "making stem cells in a lab dish" is in reference to embryos produced via Somatic Cell Nuclear Transfer (SCNT) - or, in other words: cloning. The issue centers around the correct identification of the entity produced by SCNT. Biologically and genetically, that entity is an embryo, genetically identical to the donor of the somatic cell from whom the clone was produced. In fact, for the purposes of harvesting stem cells from the entity resulting from SCNT, that entity must prove to be a viable embryo that undergoes self-directed development from the initial single-celled zygote into a 5-7 day-old embryo at the blastocyst stage. The Coalition continues to divert this issue by intentionally mis-identifying this entity as a "clump of cells", a "ball of cells", or other similar terms. Doing so provides a means to avoid the reality that SCNT produces a cloned embryo. Thus, they are able to ignore the biological and genetic reality, and claim some arbitrary "birth of a cloned human" as the "cloning" that is "strictly" banned. protected that form of research by passing Amendment 2 last year." that embryo. They cannot be produced apart from the embryo using SCNT. On your second point -- yes, I know and agree that SCNT produces an embryo [which] is then harvested for stem cells. I think you misread my use of the word solely. I did not mean to imply that all that is produced are stem cells. There are limits to the territory that I can cover in a 350-word story. In lengthier stories -- of which I have written several -- I deal with these issues more thoroughly. Even so, I stand by my story. ...For three years, I have strived to cover this issue with detachment and fairness. And I believe that if you ask around, I have a good track record in this regard. While I certainly infer a bias in the end result of the article in question, I want to be fair in asserting the source of that bias. To that end, I did my best to research Mr. Franck's past articles. He was kind enough to send me the copy of a rather lengthy piece he wrote, and of which I found a copy at the Center for Genetics and Society website. I also found recent Post-Dispatch articles here and here, as well as a copy of an article reposted here. After reading this broader sample of Mr. Franck's writing on the Amendment 2 issue, I believe that he is correct in his assertion that he has made every effort to deal with the issue with detachment and fairness. While I disagree with repeated use of incorrect and/or potentially misleading terminology (such as referring to an embryo as a "ball of cells" or "clump of cells" or "cluster of cells"), an overall reading of his articles lends me to believe that he has attempted to present each side of the issue fairly. I believe any overt bias inferred from these articles - and in particular, the article I originally critiqued - results from the limited scope of a shorter article and, more importantly, the editorial bias of the Post-Dispatch. Finally, I would like to thank Mr. Franck for taking the time to respond to my email. Not many reporters would take the time to do so - especially to respond to someone being critical of that reporter's work. The St. Louis Post-Dispatch today reported that MO House Bill HJR11 was killed in committee yesterday. Unfortunately, the P-D could not see past its own bias in order to report accurately on the measure. Ironically, in order to spin the truth, the article exposes the hypocrisy and deception of Amendment 2. A House committee killed legislation Monday designed to largely invalidate a new constitutional amendment protecting stem cell research. The 3-4 vote by the House Rules Committee all but ends efforts this legislative session to overturn Amendment 2, which 51 percent of voters approved in November. Section 38(e). 1. The general assembly may enact laws concerning health care research, including controlling taxation, appropriations, and use of public resources for health care research, and regulating research that could pose a risk to human life or health. 2. It is unlawful to engage in human cloning. For the purposes of this section and section 38(d) of this article, "human cloning" means the creation of a human zygote, human blastocyst, or human embryo by any means other than the fertilization of a human egg by a human sperm. 3. The provisions of this section supersede any provision of section 38(d) of this article that is inconsistent with this section. Opponents of Amendment 2 had wanted lawmakers to send a ballot measure to voters in November 2008. The proposed amendment would have asked the public to ban all forms of human cloning, including when the research is used solely to produce embryonic stem cells. Voters specifically protected that form of research by passing Amendment 2 last year. The proposed amendment would have asked the public to ban all forms of human cloning, including when the research is used solely to produce embryonic stem cells. Did you catch it? The problem with this statement is that "the research" - that is, human cloning - is never used "solely to produce embryonic stem cells", since the result of human cloning is - always and by definition - a human embryo, not just embryonic stem cells. The problem with this rationalization is the same problem that the proponents of Amendment 2 had during their 30 million dollar campaign of deception: the claim that Amendment 2 would "strictly ban human cloning". In fact, as both an educated reading of the wording of the amendment as well as the double-speak found in this P-D article reveal, Amendment 2 not only did no such thing, it actually made human cloning constitutionally protected in the state of Missouri. "I'd say that a third (of House members) will be happy they don't have to vote on this," said Shannon Cooper, R-Clinton. Cooper, who serves as chairman of the House Rules Committee, said he voted against the measure simply because he supports Amendment 2. If Amendment 2 "strictly bans human cloning" - as its supporters claims it to do - why would an Amendment 2 supporter vote against a measure that would allow Missouri voters explicitly to ban all forms of human cloning? Any proponent of Amendment 2 could only oppose such a measure if in fact human cloning were a part of Amendment 2. That supporters of Amendment 2 oppose this measure demonstrates that their claim that Amendment 2 "strictly bans human cloning" was an outright lie. Cooper - and those like him - should be ashamed of himself, and is a disgrace to the Missouri Republican party. Duplicity, hypocrisy, lying, and subverting the democratic process have no place in the Republican Party. For one, if his beloved Amendment 2 "strictly bans human cloning" then what does he have to oppose in HJR11? For another, even if he legitimately opposes HJR11, how dare he deny the voters of Missouri the opportunity to exercise our democratic right? The truth, which should now be plainly evident to all, is that Amendment 2 constitutionally protected human cloning for the purpose of human-embryo-destructive research, and that the proponents of Amendment 2 knew this truth and intentionally mislead Missouri voters into believing that passing Amendment 2 would "strictly ban human cloning". First, they tried to re-define "embryonic" as "early". Next, they tried to re-define "cloning" as "implantation". Now, they're trying to re-define "cure". Winship says there have been no proven cures found with embryonic stem cell research and said adult stem cells are a proven - and ethical - alternative. "The reality is, it’s still zero" cures "for embryonic stem cells," she said. Farrow said embryonic stem cell opponents would do anything to derail the initiative, including overstating the potency of adult stem cells. "You’ll hear our opponents say that there are between 65 to 100 adult stem cell cures. That’s simply not true," Farrow said. "The truth is there are only nine adult stem cell cures, and we believe that research needs to go forward," she said. "But adult stem cells have been researched for over 50 years. The first earlier embryonic stem cell research didn’t start until 1998. We haven’t even had a full decade of research with embryonic stem cells." Dr. William Neaves is with the Stowers Institute Medical Research. "This is a contest between society and disease, not between adult stem cells and early stem cells," says Neaves. Researchers say embryonic stem cells hold infinitely more potential than adult stem cells for curing disease. They say the claim about dozens of treatments already developed from adult stem cells is not true. "At best, only nine of those diseases have, after 50 years of research with adult stems cells, FDA-approved therapies that are available to patients," says Neaves. The Coalition is obviously hedging on the belief that the general public have no real understanding of what FDA approval is, what it means, or how it happens. I will try to give a brief overview. FDA is divided into various "centers". I work for a pharmaceutical company that manufactures, packages, and sells drugs. We are under the direction of FDA's CDER: the Center for Drug Evaluation and Research. Medical devices - pacemakers or defibrilators, for example - are under the direction of CDRH: the Center for Devices and Radiological Health. Stem cell treatments are under yet another center - CBER: the Center for Biologics Evaluation and Research. In order for a drug, device, vaccine, or other treatment (hereafter, treatment) to get FDA approval, a rigorous and intensive process is required. The sponsor (company requesting approval) must complete a submission application including all the data supporting the approval request. For a new treatment, the submission would include data from three phases (Phase I, Phase II, Phase III) of clinical studies. These clinicals are the heart of the company's justification for requesting approval. Phase I clinicals are very small (less than 100 participants) studies, generally using healthy humans, to determine physiological interaction of a treatment with humans. Phase II clinicals follow successful of Phase I, and are controlled, small-scale (a few hundred participants) studies using people who have the condition for which the treatment is indicated, used to determine preliminary data with respect to the effectiveness of the treatment, and any side effects associated with the treatment. Phase III clinicals follow successful completion of Phase II, and are controlled (or uncontrolled), large-scale (a few hundred to thousands of participants) studies used to determine the effectiveness of the treatment for the general population, and to ascertain the overall risk-benefit relationship of the treatment. Based on these data, in addition to other aspects of the submission (stability data for a drug, for example), FDA will approve or reject the application. Once FDA has approved an application, the sponsor can legally market and sell the treatment in the US. As with many other treatments, due to the nature of the conditions for which stem cell treatments are intended, such treatments are not always well-suited for typical clinical trials. FDA is aware of and working to reconcile the difficulty of translating stem-cell treatments into clinical trials. Note, however, that other mechanisms exist, prior to or in lieu of FDA final approval, for treatments to be used (legally and effectively). Two such mechanisms are the Treatment Investigational New Drug (Treatment IND) approval, in which "FDA will permit an investigational drug to be used under a treatment IND if there is preliminary evidence of drug efficacy and the drug is intended to treat a serious or life-threatening disease, or if there is no comparable alternative drug or therapy available to treat that stage of the disease in the intended patient population", and the parallel track policy, in which "patients with AIDS whose condition prevents them from participating in controlled clinical trials can receive investigational drugs shown in preliminary studies to be promising." Some treatments - such as prenatal drugs - may never proceed through all clinical phases and final approval, but may be given to patients as investigational treatments for non-approved indications as long as the patient gives informed consent (which is also required for participation in clinical studies). Such is the case for Treatment INDs discussed above. The bottom line is this: all treatments administered in the US must have FDA approval, whether in the form of a final New Drug Approval (NDA), or as an Investiational New Drug approval (IND). So, of the more than 72 treatments currently in use, every single one in use in the US has FDA approval of one form or another. This argument is not unique to the Missouri Amendment battle. In this 07/06 letter to Science, Do No Harm refutes the argument for the straw man that it is, and also points out that some 1170 clinical trials involving stem cells currently exist, including some 565 trials currently active and seeking participants - while not one single clinical trial is underway for embryonic stem cell treatments. Moreover, the letter points out that there are currently no peer-reviewed references to embryonic stem cell-derived human treatments. The above-referenced list of 72 human treatments derived from adult stem cells, which Do No Harm maintains, includes only those treatments for which peer-reviewed scientific publication of their effectiveness exists. Yet again, the Coalition can only offer mistruths and deception. Last night, I attended the Christians Against Human Cloning Rally, held at Life Christian Church and sponsored by Vision America/Missourians for Truth. Speakers included Shao-Chun Chang (professor of medicine at Washington University in St. Louis), Charles Drury (Hotel Developer), Archbishop Raymond Burke, Rich Bott (executive vice president, Bott Radio Network), Rick Scarborough (President, Vision America), Phyllis Schlafly (Founder and President, Eagle Forum), and Alan Keyes. "It is wrong to create human life for the purpose of destroying that life." "The most fundamental premise of our nation is not that we have rights, but that our rights come from God." UPDATE: See the Flickr photoset for the rally. The Post-Dispatch covered the rally. Below are some excerpts from the article. (St. Loius Archbiship Raymond) Burke, head of the St. Louis Roman Catholic archdiocese, joined other regional and national religious conservatives - from Eagle Forum founder Phyllis Schlafly to commentator Alan Keyes - who addressed hundreds who packed the sanctuary at the Life Christian Church, 13001 Gravois Road in south St. Louis County. "Hundreds"? My estimation was more like 2,000. I was in the balcony, and couldn't see the entire floor seating area. 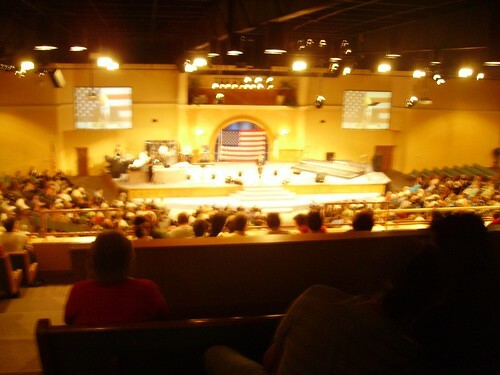 The Cape Girardeau rally had 300, and gauging by the photo, we had as many in the balcony seating, alone. In a telephone interview, (chairman of the Missouri Coalition for Lifesaving Cures Donn) Rubin contended that it was the opponents who were spreading untruths. Otherwise, he said, the Cures Coalition wouldn't have support from more than 100 groups, including research centers, health care groups and patient groups. We'll see the most fundamental of your untruths, a couple paragraphs below. And it's about time I parsed your "factsheet" as well, since every single point listed is a mistruth at best, or a bald-faced lie at worst. Critics, said Rubin, are "inventing wild claims to distract the public from what we're really voting on - the right of Missourians to obtain the same medical treatments available in other states." The "medical treatments" canard is nothing but a "wild [claim] to distract the public from what we're really voting on." Missouri's access to medical treatments available in other states has never been in question, and likely will never be in question. In the far-off (and, in all reality, unlikely) event that a human treatment derived from embryonic stem cells ever becomes available, the location of the research into that treatment will not determine the location of the application of such a treatment. The availability of such a treatment will depend only upon the availability of access to the stem cell line from which such treatment was developed. At the rally, opponents emphasized that much of the debate centers on a procedure known as somatic cell nuclear transfer, or therapeutic cloning. Under that procedure, the nucleus of an unfertilized human egg is replaced with the nucleus of another human cell. Opponents say it is a form of human cloning and cite the use of the procedure to clone Dolly the sheep. The Lifesaving Cures Coalition says the procedure is not cloning and cites the proposed amendment's specific ban against implanting such an egg in a womb. And here it is: the number one, most fundamental, outright, bald-faced lie of the Coalition. By definition Somatic Cell Nuclear Transfer (SCNT) is cloning; cloning is SCNT. The two terms are interchangeable. In genetics, somatic cell nuclear transfer (SCNT) is a technique for cloning. This technique is currently the basis for cloning animals, such as the famous Dolly the sheep, and could theoretically be used to clone humans. Scientists at the Harvard Stem Cell Institute are currently researching a technique to use somatic cell nuclear transfer to produce embryonic stem cells. For human cells, no other method exists as a viable means of cloning. Let us freely admit that the procedure used to produce human stem cells for research is cloning, but not in any way part of a process for creating human babies. The distinction should be clear. The distinction is clear, but it is also irrelevant. Your Coalition is promoting Amendment 2, specifically stating that the amendment "bans human cloning" - yet, you never reveal that the amendment uses a conjured definition of "cloning" not recognized anywhere else, nor do you point out that the amendment actually prohibits the banning of human cloning - that is, cloning according to the proper usage of the term. So, which side is it, again, using distractions and spreading untruths? Scarborough said the number of Missouri rallies would depend on how much money can be raised to pay for them. So far, each rally has cost close to $20,000. That includes Keyes' speaking fee of $2,500. The Lifesaving Cures' leaders point to the payments as evidence that Keyes and Scarborough may have financial motives. Scarborough said he was offended by such talk, and added that Keyes' payment was a fraction of his usual speaking fee. Let's compare rallies, shall we? From their state-of-the-art audio/visual equipment to the busloads of backers brought to town from across the state, it was clear supporters of an effort to amend Missouri's constitution to protect embryonic stem cell research spared no expense at a Monday morning campaign kickoff rally. With an audience of nearly 150 proponents at the Capitol Plaza Hotel prompted to applaud on cue and a podium of speakers from the political to the poignant, the rally in favor of the Missouri Stem Cell Research and Cures Initiative had the look and feel of a television talk show. Are you going to imply, with a straight face, that all of the Coalition's speakers are speaking without compensation? Further, what of the over ten million dollars in Coalition support from the Stowers Institute? Would you actually lead to believe that this investment is made without an expectation of a return? Follow the money, indeed! Just how safe is it for women to donate eggs for SCNT research? Apparently, the Primacy of Awesome (who can't seem to follow blog-linking protocol well enough to trackback to my original post), considers me to have made a humorous attempt at reasoning. In fact, to attribute rights to embryos is to call for the violation of actual rights. Since the purpose of rights is to enable individuals to secure their well-being, a crucial right, inherent in the right to liberty and property, is the right to do scientific research in pursuit of new medical treatments. To deprive scientists of the freedom to use clusters of cells to do such research is to violate their rights–as well as the rights of all who would contribute to, invest in, or benefit from this research. The last person to try such reasoning did so in order to implement said scientific research on another group of humans deemed unworthy of the rights to life, liberty, and the pursuit of happiness. The end result: the death of millions of Jews in the Holocaust. That’s right! Pro-stem cell research equals genocide. And for some reason Ayn Rand is rolling in her grave because… Objectivists are now pro-holocaust? You really gotta see this one to believe it. First, let me point out that Primacy of Awesome fails to distinguish between embryonic and adult stem cell research; therefore, the first statement of his conclusion is specious. On the matter of embryonic stem cell (ESC) research, that conclusion isn't nearly as hyperbolic as the author would lead you to believe. Considering that the authors of the original article failed in their attempt to redefine the definition of a "human being", the fact that ESC research will require the destruction of countless human embryos may lead some to consider the line of research analogous to genocide. In that comparison, I did not in any way address the purpose of using such a reasoning, but rather the reasoning itself. Primacy of Awesome missed this point entirely. The similarity lies in the use of the same form of reasoning in order to obtain a desired end. The Nazis rationalized that Jews were inferior as humans, and thus reasoned that their rights to life, liberty, and the pursuit of happiness were subservient to the Nazis' right to perform scientific experiments on them. The authors rationalized that human embryos are not human beings, and thus reasoned that their rights to life, liberty, and the pursuit of happiness were in violation to the rights of scientists to use them for research for the securement of the well-being of other humans. The comparison is especially germane, since in both cases, the preliminary rationalization is clearly and demonstrably false. The Jewish victims of the Holocaust were every bit intrinsically valuable has human beings as were the Germans who carried out the Holocaust; likewise, human embryos are every bit intrinsically valuable as human beings as are those who wish to use them for scientific research. To be quite clear (since, apparently, Primacy of Awesome requires the carification): to compare the use of faulty reasoning in two circumstances makes no inherent value judgement concerning the relative evil of one end versus the other. I reserve that judgement for abortion. Update: Primacy of Awesome added a trackback to the original post. Thanks, Mike!